This special edition of Triples features all the capture and fun of the original version, but with patriotic extra features. The game board is enhanced with stars and stripes pieces and includes the political option to play either as a Democratic or Republican. See who wins more often! Here’s how. Try the new Triples on your Palm OS device and then go to our forum (the link is below) and post your opinion about the game. The first post will get a copy of the game – no charge – and 2 more winners will be randomly picked. If you already have a copy of Triples you can choose a copy of WordPop, Word Monaco, Farkle Dice or Word Watch. – Two random winners will also be picked — will it be you? 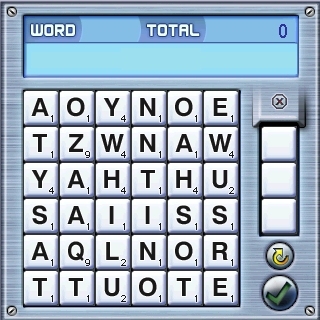 If you enjoy a good challenge, why not take a peek at this screen shot of WordPop and see if you can find the longest word possible? Points don’t matter; just sheer length. But you must follow the WordPop rule that each letter must be adjacent to the next, such as TOY. The longest word submitted wins, plus two random entries. Each winner will receive a free copy of WordPop, Word Watch, Word Monaco, Triples or Farkle Dice for the Palm OS or the Pocket PC. Here are the winners from our last contest. Each newsletter has a contest and a chance to win a Palm, Treo, or Windows Mobile game from Smart Box Design. How do they come up with these great solutions?! Below are winners from both the longest words and chosen at random. You can see their winning words here.